Cape Town - Cricket South Africa (CSA) on Monday congratulated the Proteas Castle Lager squad on their emphatic 2-0 series victory over the New Zealand Black Caps. The Proteas won the first match by an innings and 27 runs at Sahara Park Newlands and the second, which finished today, by an innings and 193 runs at Axxess St. George’s. 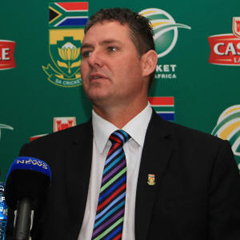 “The Proteas have played consistently outstanding cricket by any standards,” commented CSA Acting CEO Jacques Faul. “As the No 1 ranked Test team in the world they are setting extremely high standards and they are a group of young men of whom I am sure the entire country is justifiably extremely proud. “What has really stood out for me has been the fact that this has been a real team performance. Our stalwarts of old continue to do well but there are a lot of relative newcomers making their mark as well. It is a sign of an excellent team environment that they can lose the No 2 ranked bowler in the world and make a smooth change of personnel without any discernible difference to the outside observer. “The other stand-out feature for me has been the way the players enjoy each other’s successes and this is a sign of the wonderful spirit of comradeship that is evident for all to see and is a feather in the cap of our leadership team of Gary Kirsten and Graeme Smith. “We now look forward to the three-match Sunfoil Test Series against Pakistan which starts on February 1 at the Bidvest Wanderers Stadium.